We’re excited to announce starting today subaccounts can be created to allow other users to view your servers’ analytics! You can now let others, such as staff members, view your server’s analytics without giving them complete access or sharing login credentials. 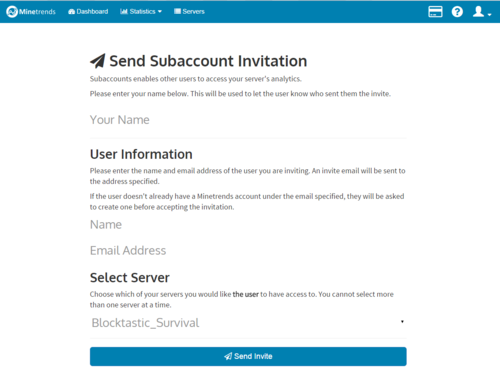 To create a subaccount visit the subaccounts page and fill out the questions. Once submitted, an email invite will be sent to the recipient. The recipient can then either register a new Minetrends account or login to accept the invite. After the invite has been accepted the user now has limited access to the server! We are really happy with this release and looking forward to your feedback!